Whether he is singing in the choir, eluding tacklers on the football field or gliding effortlessly over a hurdle on the track, Peter Guenther puts everything he has into what he is doing. The gifted Gilroy athlete made the most of his senior season — winning Central Coast Section titles in the 110-meter hurdles and the 300 hurdles. For those accomplishments he is the All-Mercury News boys track and field athlete of the year. Guenther started the year as the Mustangs' lightning-quick running back. He averaged 8.2 yards per carry and combined for more than 800 yards of rushing and receiving. But as soon as the football season ended, Guenther devoted himself to track and field. "I loved playing football and being part of the team," Guenther said. "We had a rough game against North Salinas; some of those bruises last the whole season. You have to commit to tearing up your body to play football, and I thought I had a chance to go farther in track and field." It was an intelligent choice for Guenther, who has earned a track scholarship to compete at UC-Riverside. 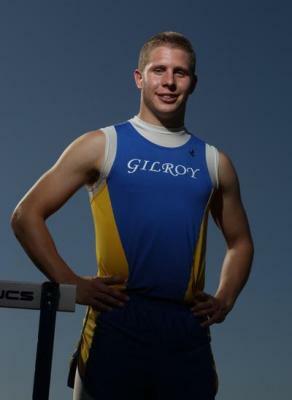 "Once Peter started focusing on the hurdles, he showed a real dedication to his craft," Gilroy Coach Jeff Myers said. "He is very meticulous and critiques everything he does in a race. He did everything he could to become a better hurdler, from watching others to reading about the sport. He covered every angle." At CCS, Guenther cruised to victory in the 110 hurdles in 14.68 seconds but won the 300 hurdles in dramatic fashion. Archbishop Mitty's Jeffrey Campbell made a late charge, and both runners dived for the finish line. Guenther wasn't sure who had won until he heard his name called. He won by four-hundredths of a second (38.16). Also an excellent student and singer, Guenther sang the national anthem as part of a barbershop quartet before the CCS competition, and immediately after the meet he met up with members of the Gilroy Chamber Choir to perform a Disney-themed concert that night. Guenther played the part of Peter Pan, decked out in green from head to toe. "When I walked in there, I told the director I had won and everyone started singing 'We Are The Champions.' That was one of my best moments," said Guenther, who performed at Carnegie Hall with the Chamber Choir this year. "I was so happy to have won two CCS titles, then I walked in there to something else I love and had everyone cheering. I felt really honored." Coming into the state meet, Guenther was hoping to run personal bests in both hurdles, and he came through in Friday's preliminaries, where he ran a 14.40 in the 100 hurdles and a 37.71 in the 300 hurdles. His 300 time was good enough to qualify for the finals, where he finished seventh. In the 300 preliminaries, Guenther ran in the same heat as La Sierra-Riverside's Reggie Wyatt, who set a national record with a time of 35.02. "Instead of Wyatt pulling me to my best time, I can say I pushed him to a national record," Guenther said with a laugh. "But that was a great race; I ran my best time and got to be part of history." As a junior Sainion missed his goal of earning a state berth in the 100 meters by three-hundredths of a second with a fourth-place finish at the Central Coast Section meet. This year the senior worked on his starts and his technique coming out of the blocks and had successful results. He finished third in the CCS meet in the 100 (10.87) and the 200 (22.19), earning trips to the state meet in both events. He finished 13th at state in the 100 (10.74) and 18th in the 200 (22.23). "It was a great year," Sainion said. "Everything came together like I was hoping it would." Coming off an excellent cross-country season in which he won a CCS Division II title, Rowe ran the 3,200 meters and finished second in the state Division II race. Rowe took second at CCS, finishing in 9 minutes, 8.17 seconds, behind Sobrato's Lance Wolfsmith (9:07.10). But he saved his best race for the state finals at Buchanan High in Clovis. In a race in which eight runners broke the nine-minute barrier, the junior shaved 13 seconds off his personal-best time and finished in 8:55.71, good for fourth place. When Toney was a sophomore he no-heighted in the pole vault at the CCS meet, but he had a chance to compete with two-time state champion Nico Weiler of Los Gatos. This season, the junior was in the thick of the competition at CCS, finishing fourth behind champion John Prader of Salinas (15 feet, 10 inches) and qualifying for the state meet with a vault of 15-2. At the state meet he qualified for the finals by clearing 15-3 and finished ninth with a mark of 14-11. Taylor was a key factor in the Cougars' march to a third-place finish at CCS. He won the triple jump with a mark of 47-3﻿1/2 and took second in the high jump with a leap of 6-4. Taylor scored 18 of the Cougars' 26 points. At the state meet, Taylor earned a spot in the triple jump finals, finishing eighth with a mark of 45-9﻿1/4. Butler is a versatile athlete who plans to continue his track and field career as a decathlete at Cal. He has pole vaulted 14 feet and finished fourth (15.35) in the 110 hurdles at the West Catholic Athletic League meet. At CCS, Butler finished third in the discus with a then-personal-best of 153-7 and was third in the shot put (48-8). He improved dramatically at the state meet in the discus — shattering his previous best with a throw of 170-11, good for sixth place and a place on the medal stand. 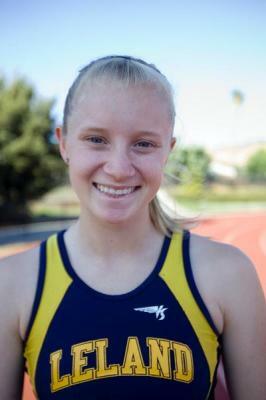 Leland's Katie Nelms produced a track and field season to remember, but the versatile junior wasn't satisfied. A talented hurdler, Nelms won her second Central Coast Section title in the 300-meter hurdles and finished second in the 100 hurdles. She also finished second to Pinewood's Angela Gradiska in the 100-meter dash and ran a leg on the Chargers' 1,600 relay team, which finished sixth. Her all-out effort was the key factor in the Chargers' run to the first CCS title in school history. She followed that stellar performance by finishing second in the state 100 hurdles (13.95) and fourth in the 300 hurdles (42.94). For those accomplishments, Nelms is the All-Mercury News girls track and field athlete of the year, but don't expect her to rest on her laurels. "This season I didn't perform as well as I would have liked," Nelms said. "But I feel like I really grew as a runner. This is the first time I've trained 11 months of the year. I found a rhythm and came away from it with a hard-work ethic and a better technical approach to the hurdles." Nelms ended the season with the top CCS times in the 100 hurdles (13.70) and the 300 hurdles (42.65), while posting the second-best times behind Gradiska in the 100 meters (11.85) and 200 meters (24.71). She also had the third-best time in the 400 meters (56.67). "It's been really exciting to watch a young lady who is so determined and willing to take a chance at so many different events," said Rudy Montenegro, a Leland track and field coach. "She wants to be the best and keeps coming after it." Nelms scored 26 of Leland's 39 points at CCS. The Chargers also got help from Harvard-bound Stephanie Barnett, who finished second in the 3,200, and Lauren Chin, who was fifth in the long jump and the triple jump. "I pride myself on having versatility; it helps with my races and also helped the team," Nelms said. "I was super stoked that we were able to win the team title." Now Nelms is focused on the USATF World Youth Trials, which run Tuesday through July 5 at Eastern Michigan University. Athletes who place in the top two at that event are eligible for the World Youth Championships in Italy the following week. Nelms will compete in the 100 hurdles and the 400 hurdles in Michigan. By battling for medals at the state meet, Nelms feels she has gained the confidence she needs to perform on the national stage. Before this season she felt her best race was the 300 hurdles, but she improved dramatically in the 100 hurdles and now views them as equals. In the state 100 hurdles finals, she was spiked in her lower left leg coming over the third hurdle, but she stayed focused and managed to edge two others with a surge for second place in 13.95. In just her third year of running track, Gradiska established herself as one of the top high school sprinters in the nation. After winning Central Coast Section titles in the 100- and 200-meter dashes, Gradsika moved on to the state meet, where she had a breakout performance. Gradiska won both her heats in the Friday preliminaries. Her time of 11.67 in the 100 was — at the time — sixth-best in the nation. She had another personal best in the 200 meters (23.64), shaving 41-hundredths off her previous mark. Gradiska backed up those times with strong runs in the state finals, taking second in the 200 (23.85) and fourth in the 100 (11.74). Expect the highly recruited junior to contend for gold medals in both events next season. The junior has been a standout since her freshman year when she finished second in the 800 meters at CCS. Diaz was third at CCS in the 800 as a sophomore and second this season with a time of 2 minutes, 13.75 seconds — less than a second behind Carlmont's Justine Fedronic, who missed the state meet because of an injury. Diaz, a three-time state qualifier, had her heart set on winning a medal this year. After reaching the final, Diaz was coming down the stretch in seventh place with her cousin, Bishop O'Dowd's Lia Rivers Birt, in front of her. Diaz surged to the tape to edge Birt by nine-hundredths of a second. "I was just thinking I have to get a spot on the medal stand," Diaz said. Dolbec is an outstanding athlete who also starred on the volleyball team and will compete in both sports at UC-Santa Barbara next season. As a freshman, Dolbec qualified for the state meet by clearing 5 feet, 4 inches at the CCS meet. She won the CCS title as a sophomore but was unable to defend her title as a junior after suffering from appendicitis at her junior prom. Dolbec, who has cleared 5-10 in practice sessions, returned this year to win another CCS title by clearing 5-6, and she won her first state medal with a sixth-place finish in Clovis at 5-6 once again. The freshman considered herself to be a sprinter entering high school and still runs on relay teams and in sprints. But Coach Steve Nelson urged her to try the jumps, and the results were immediate. Leath won the CCS triple-jump title with the 10th-best mark in section history (39-41/4). In the state meet, Leath conquered a case of the jitters in the preliminaries with a personal best of 39-6﻿1/4 to reach the finals, where she finished ninth. The junior continued to build on the promise she showed as a freshman when she finished third at CCS in the shot put. McKee was second in the shot last year and fourth in the discus. This season McKee broke through for her first section title, winning the shot put with a throw of 42-11﻿1/2. She also earned a trip to the state meet in the discus, finishing third with a toss of 127-6 in the finals.